I visited Shoppers Stop to buy some peachish pink shade lip colour for myself which I wanted for long. I tried out all brands there but could only find what I wanted in Lakme 9 to 5. And this colour, I would say is pure magic. I am in love with it. Pure beauty. Packaging is very pretty. Pink girly tube with a firm bullet inside that doesn’t melt or break and is quite travel friendly. It is a matt shade. But despite that, it doesn’t leave the lips dried or creased. IT gives a very smooth application and is so soft and creamy. The best thing is it doesn’t bleed, feather or crease. The pigmentation is quite good. Just start applying it and after 1 or 2 coats, you get the desired colour. This range from Lakme is named as 9 to 5 and this lip color sort of lives upto this claim. It stays as it is for almost 6 hours easily surviving meals and tea and water Jbut even after that when it starts fading, it looks beautiful. I am not required to do any touch ups for this for 8 hours and it stays :). Soft creamy formulation while giving matt effect. Stays long, almost 7 hours easily in non AC environment :). Very rich colour with nice pigmentation. Contains the goodness of wheatgerm oil and Vitamin E.
May seem dry to some. Please moisturize your lips before applying. 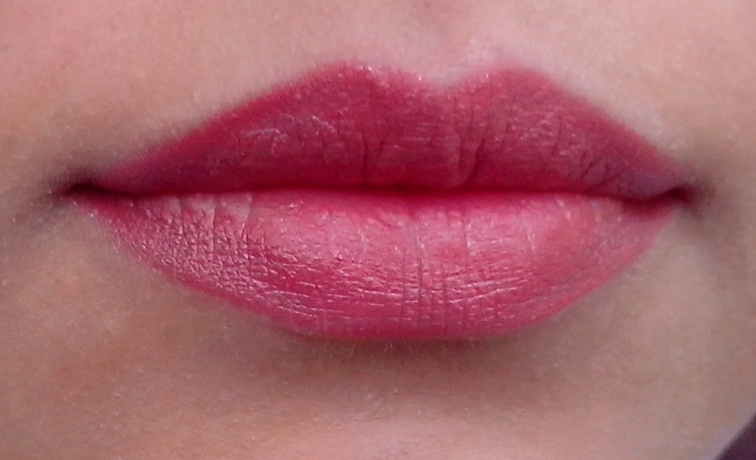 This is a very pretty shade from Lakme 9 to 5 for daily use and will suit Indian skin tones very well. I am dusky and it looks pretty good on me (but with makeup on ;)). I would surely repurchase it and recommend it.